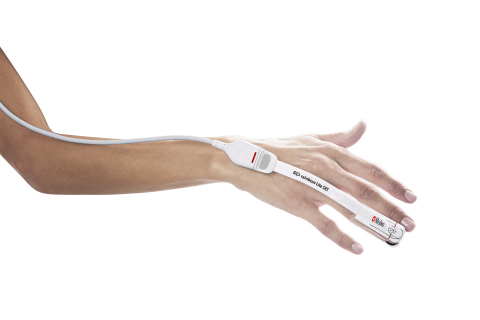 NEUCHATEL, Switzerland--(BUSINESS WIRE)--Masimo (NASDAQ: MASI) announced today the CE marking and release of RD rainbow Lite SET™ sensors, which enable the monitoring of Masimo Oxygen Reserve Index™ (ORi™) and RPVi™, an improved PVi® that allows clinicians to assess fluid responsiveness noninvasively and continuously1 at a fraction of the cost of invasive methods, and at a fraction of the cost of rainbow® sensors. rainbow Lite sensors utilize twice as many wavelengths of light as SET® sensors, allowing rainbow Lite sensors to provide ORi and RPVi along with Masimo SET® Measure-through Motion and Low Perfusion™ pulse oximetry. Castillo A et al. Prevention of Retinopathy of Prematurity in Preterm Infants through Changes in Clinical Practice and SpO2 Technology. Acta Paediatr. 2011 Feb; 100(2):188-92. McGrath SP et al. Surveillance Monitoring Management for General Care Units: Strategy, Design, and Implementation. The Joint Commission Journal on Quality and Patient Safety. 2016 Jul; 42(7):293-302. This press release includes forward-looking statements as defined in Section 27A of the Securities Act of 1933 and Section 21E of the Securities Exchange Act of 1934, in connection with the Private Securities Litigation Reform Act of 1995. These forward-looking statements include, among others, statements regarding the potential effectiveness of Masimo RD rainbow Lite SET™ sensors, ORi™, RPVi™, and PVi®. These forward-looking statements are based on current expectations about future events affecting us and are subject to risks and uncertainties, all of which are difficult to predict and many of which are beyond our control and could cause our actual results to differ materially and adversely from those expressed in our forward-looking statements as a result of various risk factors, including, but not limited to: risks related to our assumptions regarding the repeatability of clinical results; risks related to our belief that Masimo's unique noninvasive measurement technologies, including Masimo RD rainbow Lite SET sensors, ORi, RPVi, and PVi, contribute to positive clinical outcomes and patient safety; risks related to our belief that Masimo noninvasive medical breakthroughs provide cost-effective solutions and unique advantages; as well as other factors discussed in the "Risk Factors" section of our most recent reports filed with the Securities and Exchange Commission ("SEC"), which may be obtained for free at the SEC's website at www.sec.gov. Although we believe that the expectations reflected in our forward-looking statements are reasonable, we do not know whether our expectations will prove correct. All forward-looking statements included in this press release are expressly qualified in their entirety by the foregoing cautionary statements. You are cautioned not to place undue reliance on these forward-looking statements, which speak only as of today's date. We do not undertake any obligation to update, amend or clarify these statements or the "Risk Factors" contained in our most recent reports filed with the SEC, whether as a result of new information, future events or otherwise, except as may be required under the applicable securities laws. Masimo announced today the CE marking and release of RD rainbow Lite SET™ sensors, which enable the monitoring of Masimo ORi™ and RPVi™.